The Hadron Physics Summer School 2018 (HPSS2018) is jointly organized by scientists from the Institut für Kernphysik, Forschungszentrum Jülich, and the Universities Aachen, Bonn, Bochum, Düsseldorf and Giessen. The school is jointly financed by Forschungszentrum Jülich, the Helmholtz-Institut für Strahlen- und Kernphysik of the of University of Bonn, the Helmholtz International Center for FAIR, and the Collaborative Research Center CRC110 (Symmetries and the Emergence of Structure in QCD) funded by DFG and National Natural Science Foundation of China (NSFC). The school comprises lectures and working groups (from which each participant joins one) on theoretical, experimental, and accelerator aspects. 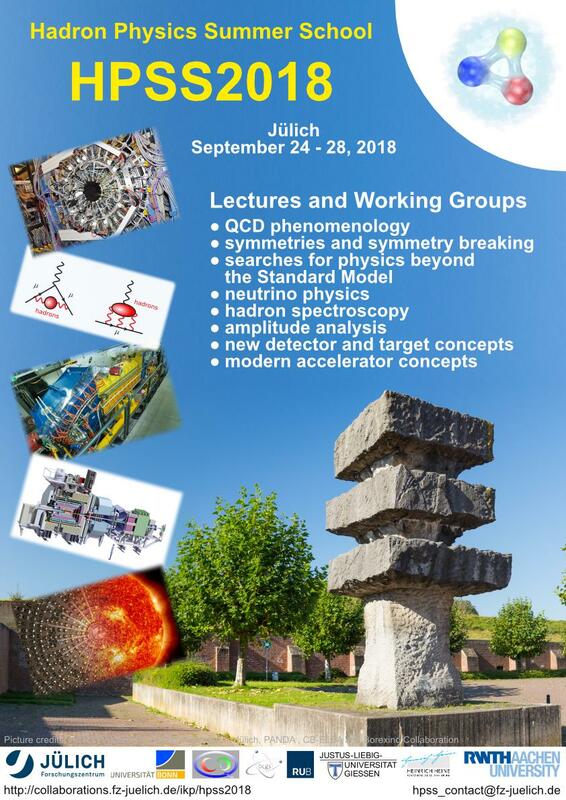 The focus is on current issues in hadron physics with emphasis on current and future programs at the accelerators COSY (Jülich), ELSA (Bonn), LHC (CERN), CEBAF (Jefferson Lab), BEPC (Beijing) and FAIR (Darmstadt) featuring experiments like PANDA, Crystal Barrel, LHCb, CLAS, BESIII, Belle II as well as the search for electric dipole moments of charged particles in storage rings (JEDI) and neutrino physics. The school is usually attended by about 60 graduate and advanced undergraduate students from various countries. We would appreciate if you announce this school to students, for whom the program might be of interest and/or post the poster (see top page) in your institute. Limited funds for travel expenses are available making the participation of young motivated students into this challenging enterprise possible.